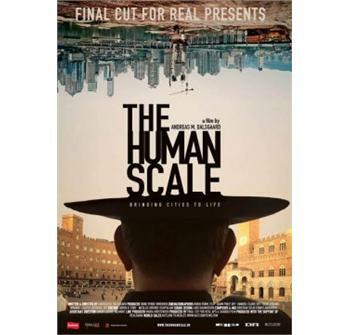 Well worth the walk – Thursday, January 29th, The Human Scale will be screened FREE at the ByTowne Cinema on Rideau St. This film is one not to be missed by anyone who wants their neighbourhood and Ward to be the very best it can be. This movie is nothing short of informative, interesting and this screening will be followed by an expert panel discussion and Q&A. 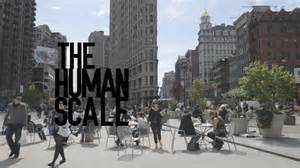 The Human Scale examines how public spaces are used and designed – a particularly relevant discussion in Ottawa at the moment with the City’s desire to increase core density. The documentary poses the question of how city’s would look and work if they were designed for humans rather than for traffic. 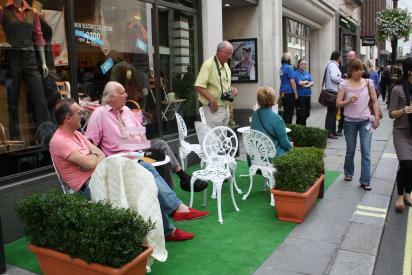 Exercises are performed whereby spaces are reclaimed; cars which allow personal property to occupy huge swaths of public space are displaced to accommodate individuals. In particular Time Square re-imagined provokes the shockingly obvious realisation in locals that there is indeed no “Square” at this world famous landmark! Danish Architect and Professor Jan Gehl who has inspired city planning in Copenhagen for 40 years argues that cities must be built to encourage human interaction, inclusion and intimacy. Let’s hope this international movement inspires Ottawa to recognise the importance of incorporating the required space for cyclists, pedestrians and infrastructures that encourage human interaction alongside traffic planning to create a more attractive, vibrant and liveable Capital city. Tomorrow is the cut-off for letters to the City Planning department on a proposal from Dharma Development that wishes to more than double the height allowed on Upper Rideau Street. I want a strolling, shopping corridor so I wrote this to City Planning. 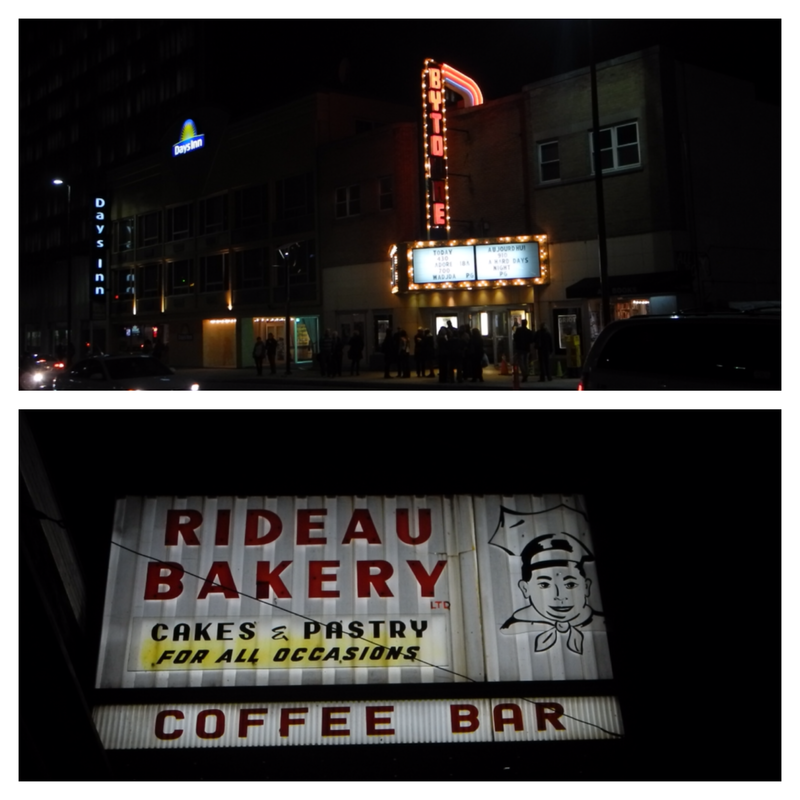 I want businesses like the Bytowne, Auntie Loos, Rideau Bakery and All Books. I want them supported by foot-fall and I want more of their ilk. Strongly worded? Yes but if we don’t advocate for our neighbourhood who will? I am writing to you today to oppose the proposal to rezone 541-545 Rideau Street. The proposal brought by Dharma Developments violates current zoning restrictions and goes directly against the City’s stated aim to create a Traditional Mainstreet (TM) on Upper Rideau. The City spent taxpayer money developing the Upper Rideau Design Plan in 2005 with the communities’ involvement to identify the best approach to creating the best possible Street. To allow rezoning is wasteful of taxpayers’ money and disrespectful of the Ward’s wishes. The City planning has stated that their “hands are tied” in respect to high-rise developments as they were zoned for height and the City must respect the owners rights. This was a response from City planning when asked why we can’t spot-rezone for lower height –it is always and only greater capacity the City bows to. Let the City have their hands tied and be respectful citizen and property owners rights in areas zoned for low-rise development. The City must have an equal obligation towards respecting the investments of property buyers that purchased in areas zoned as low-rise. Let’s finally start respecting investments equally be they by corporation or individual. To be completely clear a TM means buildings should be no higher than 19meters – ideal for light thus encouraging strolling and patios which are two much needed developments on Upper Rideau. The Dharma Development proposal wants to more than double the zoned height restriction and tear-down 541 Rideau a building noted as “of Heritage Interest”. 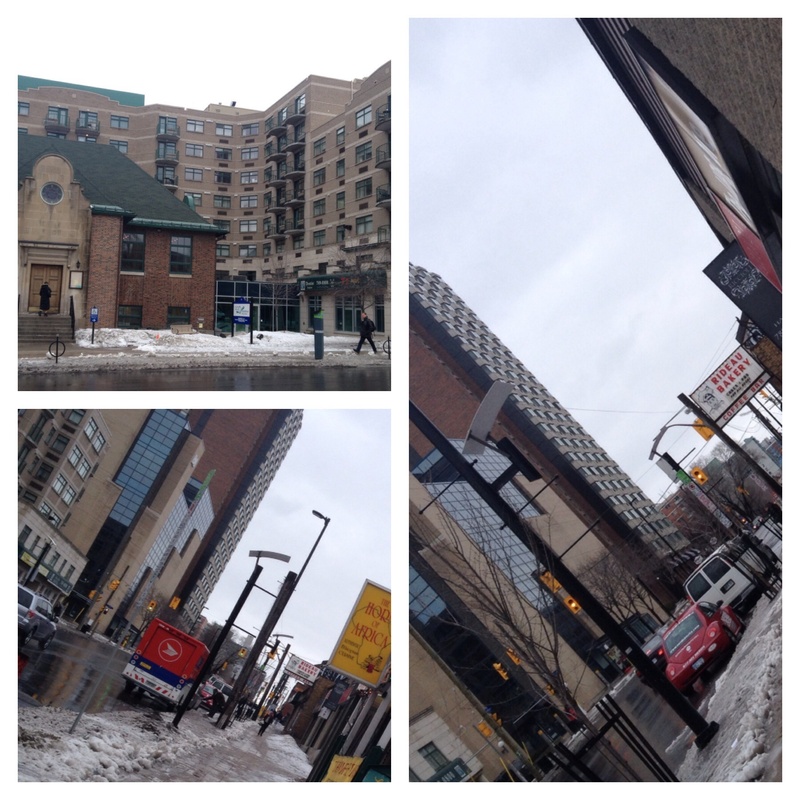 The last thing residents of the Upper Rideau want – and that the City as a whole should encourage – is the transformation of beautiful old neighbourhoods in to an extension of the wind-tunnel dark shadowed portion of Rideau Street between King Edward and Cumberland. That these old neighbourhoods have been neglected is no excuse for irresponsible development. One need only look to the transformation of Bank St in Old Ottawa South to see the flourishing benefits of listening to Community input. I want to see new developments on Upper Rideau that enhance the liveability of the street. Developments must encourage quality businesses catering to and are supported by the neighbourhood. Currently Upper Rideau St is not a “destination” it is a cut-through for car drivers. Building light-blocking high-rises will reinforce this. If the City is sincere in its stated plan then it needs to respect the Upper Rideau St Design and, as this plan states, adhere to the zoning of 19ft height that allows no more than between 6-9 stories; as opposed to the 16stories the current proposal request. The Upper Rideau Street plan was adopted 8 years ago – let’s enforce it today. Developing Upper Rideau Street properly can – given the diversity & density of the surrounding neighbourhoods including Sandy Hill, Lowertown, Vanier & the Byward Market –create a natural shopping and strolling corridor between Vanier and Byward. Doing this will strengthen the quality of businesses, the desirability of all four neighbourhoods and create a vibrant shopping street to rival any seen in Old Ottawa South or Wellington West. It is time for the City to get serious about the commitment to transform Upper Rideau – talk and planning sessions and whitepapers are nothing other than a waste of taxpayer money if they are not implemented. 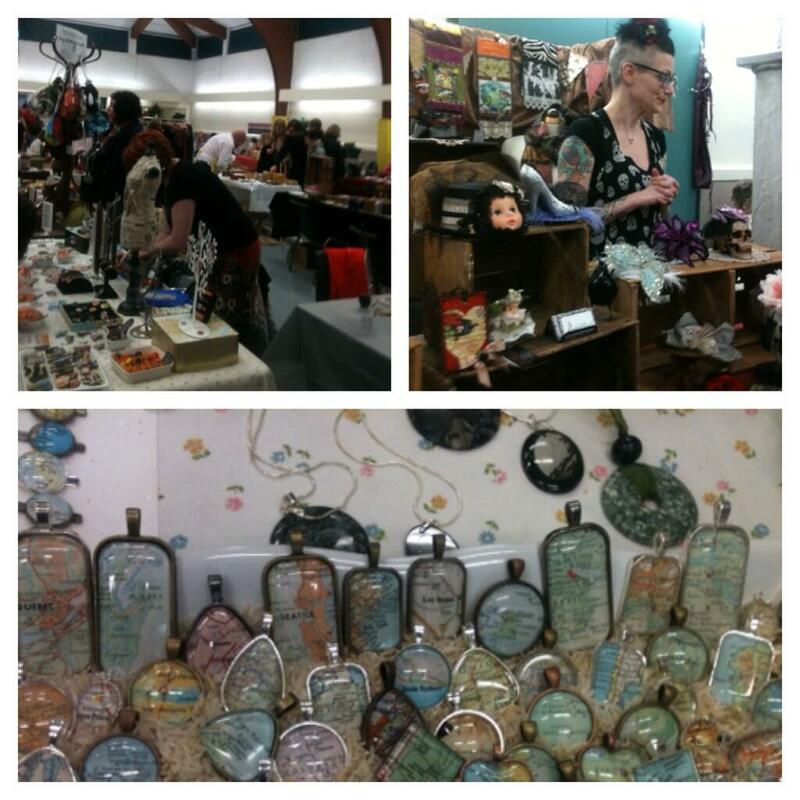 Sandy Hill had it all on its doorstep this weekend: capoiera, craft shows and screenings galore. 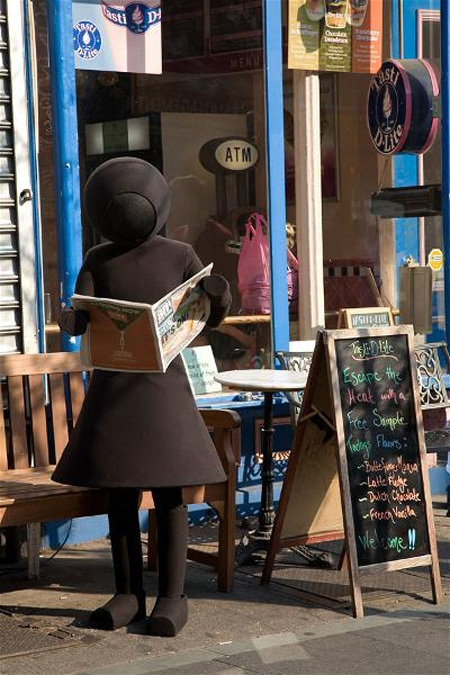 The great thing is if you missed some of these events you can still catch them locally. We couldn’t get in to the full house première screening at the Mayfair last Thursday but it’s the Bytowne Cinema to the rescue with The Human Scale on the calendar for 3 nights this week 19-21st. 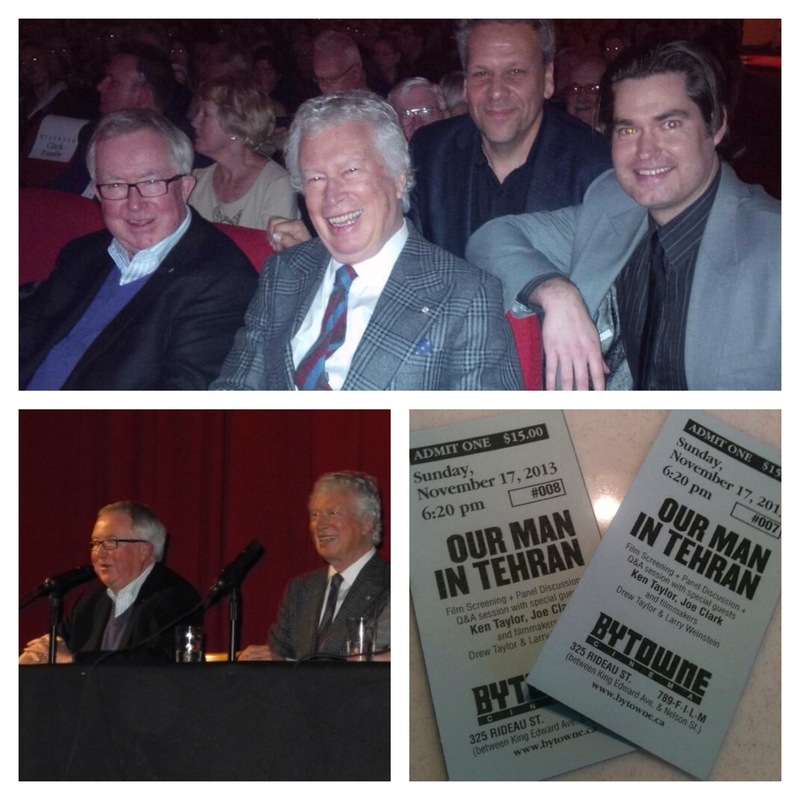 The Bytowne hosted an incredible sold-out screening of “Our Man in Tehran” followed by a Q&A panel Sunday night with former PM Joe Clark, former Canadian Ambassador to Iran Ken Taylor and film-makers Drew Taylor & Larry Weinstein. It’s on again tonight at 6:25 for those that missed out. If you’ve seen Argo and plan to see this the accurate story of the Iranian hostage crisis rescue beware this Spoiler Alert: This time around the Right Honourable Clark does not end up on the cutting room floor.